You're wondering what e-Cards are, right? This guide covers how you can get the cards, what they do, the types, and other assorted information I collected from various sources and my own knowledge. I also have the cards listed on a website which I will link to later for reference. What are e-Cards and how do they apply to Animal Crossing? The e-Reader was released for the Gameboy Advance a few years back and after Animal Crossing for the Gamecube was released Animal Crossing e-Cards became available. On October 28, 2002 the first series of Animal Crossing e-Cards became available for purchase. These cards can be used to unlock common items within the game or special rare items by making the first connection between Gamecube and Gameboy Advance. There were 4 series in total, the last being released on May 5, 2003. Where can I get these e-Readers and e-Cards? Unfortunately these materials are no longer being made, but used game shops like Gamestop in the US can provide us with these materials along with places like eBay. Some of the cards don’t run cheap, but if you want to get collecting these cards those are the places you can start. You’ll sometimes run across full sets like I did, but be sure to make sure the price is right. I purchased a complete set from eBay for about $200 so be sure to get the right price for them. As well the Nintendo store still has series 1 and series 4 packs for sale if you want to do it the old fashioned way. Please note e-Reader compatibility was removed in some of the other Animal Crossing versions in other countries. How do I connect the Gameboy Advance and Gamecube? First you will need to obviously have a Gameboy Advance and a Gamecube along with a Gamecube Link cable which can be purchased in some stores and eBay along with an e-Reader and some e-Cards. Once that is accomplished, you need to plug the e-Reader into the Gameboy Advance and the connector cord into the 4th slot of the Gamecube and the top of the e-Reader. Once this is done, you are ready to scan some cards. To scan cards, you need to go to certain areas within the game. The Post Office, the Town Tune Board, the Able Sisters; there are a few places where you can scan specific cards, but that will be covered later in the guide. For now just follow the instructions on the screen when you go to these areas. It should walk you through the process step by step. The other option is you can use the codes on the back of the cards and send them to your neighbors and receive something in return. Please do not share these codes on ACC as it could get you in trouble. First off let’s say there are many different kinds of cards and they each serve different purposes, so I will explain them each separately. Character/Sibling Cards (Series 1-4): These cards, first released in series 1 and then series 2 respectively are the majority of the cards you will happen to run across in your collection. You can scan these cards at the Post Office and receive items in the mail, or you may use the code on the back of the cards and send the code to your neighbors for a gift in return; the second option requires no e-Reader, but the rest of the cards do. There are 280 of these cards. Town Tune Cards (Series 1-4): Are you tired of your boring old town tune? Here is the answer; go to the Town Tune Board and scan some town tune cards. These cards will change your town tune to the one printed on the back of the card, so be sure to choose one that really fits your needs. As well, the town tune is on the back so you don’t need an e-Reader to use these cards. Just copy it into your game. There are 15 of these cards, one being a promotional card only that comes with the game. Design Cards (Series 1-4): Time to head to the Able Sisters. Here you can scan cards that allow you to change the patterns you are able to carry. If you want some new patterns, be sure to scan some of these in and trash your old patterns as they are pretty cool. As with some of the other cards, no e-Reader is required. Just copy the design into the game that is on the back if you’d like these designs. There are 15 cards in this set, including a promotional card found in the December 2002 issue of Nintendo Power. Player Cards (Series 2-4): This 16 card set allows you to play cool mini-games right on your Gameboy Advance. There are 8 boy and 8 girl cards in all, each playing a different mini-game. To do this, you will need to scan two dot codes into the e-Reader and you can play the games right on your portable Gameboy Advance; take the games anywhere you go. NES Game Cards (Series 4): These two rarer cards allow you to scan in two very rare NES games that are not available elsewhere: Mario Bros. and Ice Climber. These function as regular character cards but send you these cool games in the mail the next day. Be sure to get these cards as they provide some of the best games the NES ever made. 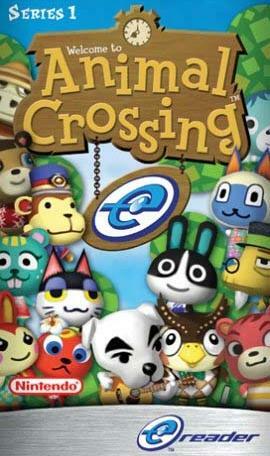 That about covers the extent of the Animal Crossing e-Reader days, but there are other games you can get e-Cards for. You’ll have to look into those as this is an Animal Crossing site, but there is so much fun to unlock with any of these e-Cards. They may not have been in production for as long as hoped, but if you’re a true Nintendo collector you don’t want to miss your chance with these. How can you trade e-Cards? You can trade e-Cards here on ACC via the trading post. It is the same as setting up a regular trade, but the expiration dates are extended and you need to provide your addresses in a Private Thread so the cards can be mailed. » ACC cannot be held responsible for anything that happens as a result of you giving your mailing address to others: Obviously there is going to be risk involved when you give out your address to people for e-Card trades. So please follow the following guidelines when giving your mailing address to others. » If you are under 18, then you must get your parents' permission before giving out your address to other members: If you are 18 or older, or if you are younger than 18, and have your parents permission, then follow the following guidelines for exchanging mailing addresses. » Exchange mailing addresses at your own risk: Again, ACC cannot be held responsible for anything that happens as a result of you giving out your mailing address, so please use discretion when doing so. » Do not post your mailing address on trade status pages, or any public forum: Trade status pages and public forums are viewable by everybody -- members and non-members. Please use either Private Threads (viewable only by mods and admins) or email to exchange mailing addresses. If your email address is viewable to the public on ACC, let the staff know by using the "Contact A Mod" button on the thread, or the "Is this user obviously scamming you?" link on the trade status page. We will remove your address from the page where it is visible. » Trade e-Cards only with people your are comfortable with: Obviously, there's no guaranteed method of knowing who is safe to trade with, but try and use good judgment and common sense when choosing who to trade e-Cards with. One thing you can consider, if you are concerned with giving your address to others, is to get a PO Box from your local post office. This will prevent others from knowing the exact address of your home. » Be extra careful when trading with new members: Since new members have not been around long enough to establish a good reputation, use extra caution when trading with new members. Don't reject all trades from members with no feedback established (since everyone has to start somewhere), but make sure they have read these guidelines, and try to use good judgment when dealing with new members. » If you cannot agree to these guidelines, do not use ACC to trade e-Cards. Have any tips for trading e-Cards? Yep, a few tips have been put together by a group of people and I'll go ahead and post them below. Just take a skim through it before you go off and trade. » As on all ACC boards the ACC Site Rules apply: In addition to those rules we feel it is necessary to add these. » Don't post your entire catalog: Please just post a few cards you're looking for, or are looking to trade to other people. Lists that are longer than five or six cards will be deleted. Please use your Catalog as an alternative. » Take trades to the Trading Post: Once you have decided who you want to trade with, create a trade with the person on the Trading Post. Discuss any info with the other person there, not on here. Do not exchange addresses or leave feedback on the boards. Also asking to trade via e-mail or chat is against the rules. All trading on ACC must be done via the Trading Post. However, mailing addresses should be exchanged via Private Threads since trades are open to all members to see. » Don't gripe about (or promote) other users: The Feedback system was designed for holding other users accountable for their trades. » Please follow the TOS for exchanging mailing addresses: It is important that we all follow these guidelines to keep each other safe. » Do not post or ask someone to post the codes off of e-Cards: Nintendo strictly discourages sharing these codes. ACC does not allow posting of any codes on any thread, including private threads. » Selling of e-Cards is strictly prohibited: Any thread asking to buy or sell e-Cards will be locked. This includes threads asking for merchandise in exchange for cards. You may only trade cards for other cards. » If you cannot agree to these tips, do not use ACC to trade e-Cards.